#KidLitCon Teams Up With RIF! I’m sure many of you are aware how RIF’s budget was decimated by the elimination of federal funds this year. I’m not going to get all political with you because the hard truth is that there are few painless answers to our economic mess. But cutting RIF is particularly harsh as it exists solely to put books into the hands of children who otherwise can not afford them. RIF is an investment in our future in the purest and most direct terms. When you think about that way, it’s hard to understand why anyone would ever put RIF on the chopping block but that is what has happened and now we just have to do what we can to make sure that future promise remains unchanged. So that’s all of you, right? Learn more Colleen’s blog. I’ll be donating and I hope you will, too! Which of the Top 100 Have You Read? Thanks to Teacherninja for this great meme! So which of Betsy Bird’s Top 100 Children’s Novels have you read? Bold the titles of any books you have read. 12. The Hobbit – Tolkien (1938)-I am checking this one off because I have tried to read it no less than 15 times since the age of ten. I have never been able to get more than halfway through without quitting! If I counted correctly, then I read 76 of the top 100. I read all of the top 27 and 46 of the top 50. How about you? 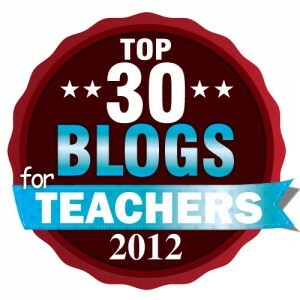 The Edublog Awards are one of my favorite blogging awards. Through the nominations I always discover new and interesting blogs. This year, I decided to take the plunge and nominate a few blogs. Best individual blog– Jen Robinson’s Book Page: Jen’s blog is amazing. She posts thoughtful, insightful reviews of many middle grade and YA books. And it that wasn’t enough, she also does the Kidlitosphere Round-up, Children’s Literacy and Reading News, and is the literacy evangelist for the Cybils. Her hard work exposes books to parents, teachers, librarians, and many others! Best resource sharing blog– Two Writing Teachers: Stacey and Ruth are my own personal writing gurus. The minilessons they share are always inspiring and never fail to make me sit down and plan out my own version. They work hard to share new mentor texts and professional books with teachers while also writing their own book. Finally, they encourage their readers to write alongside their students and they provide memes as opportunities to do this. I love participating in their Slice of Life Tuesdays and Memoir Mondays! Best teacher blog– The Book Whisperer: Donalyn Miller is the book whisperer; a teacher who can find the right book for any student in her classroom. Her blog is a veritable treasure trove of book recommendations, classroom experiences, and her own reading life. It should be required reading for any language arts or English teacher. Best librarian / library blog– Heavy Medal: A Mock Newbery Blog: Every year I run a mock Newbery with my 6th grade students. That means I read, read, read. I love to talk about my reading with other adults who enjoy children’s literature and that is why Heavy Medal is one of my favorite blogs. Jonathan Hunt and Nina Lindsay do a phenomenal job posting thought-provoking questions about eligible titles and the conversations in the comments are almost scholarly. I always leave the blog feeling like I have learned so much about children’s literature. YAY YAY YAY!!!! I literally did a little happy-dance when I read the announcement. Anyone who reads my blog regularly knows that dystopian fiction is my favorite genre. So dystopian fiction, written by one of my favorite authors? Where do I sign up?! Donalyn Miller’s recent post about reading during testing certainly hit home. My favorite part of testing – ok, really the only thing I like about testing- is watching my students open up their novels when they close their test booklets. Those of you heading into testing season should take a moment and read this! If you missed any of GottaBooks Thirty Poets/Thirty Days, be sure to check out Gregory K.’s wrap-up post. With poets like Marilyn Singer, Adam Rex, Nikki Grimes, and so many more- this is one not to be missed! YPulse has a survey up which makes me very happy. They polled tweens about their reading habits and I think many people will be surprised at some of the results. 90% of the tweens who responded say they “enjoy reading”. Yay! The kidlitosphere is a wonderful place and everyone takes care of each other. Right now, there is a wonderful opportunity to help out one of our own: The Auction for Bridget Zinn. Here’s how you can help. A group of writers who have been impressed with Bridget’s friendliness and what can only be described as her radiant joy (even now) has banded together to help Bridget with the costs she faces. One of the activities will be an online auction. Please check out the auction. All of the items up for bidding are amazing! And this is a wonderful opportunity to help out an amazing person. Please check it out! ARCs and Authors, Bloggers and Blogs! My Oh My! There have been a lot of posts in the book blogopshere this week about requesting ARCs, cool vs. uncool blogs, emailing bloggers/reviewers, and blog angst. I’ve been starring posts in my Google reader, drafting posts here on the blog, and thinking a lot of the posts over in my own head. This is going to be a mish-mosh post of ideas from all over, but I wanted to get my say about some of these topics. I feel like I walk a fine line as a blogger sometimes. TheReadingZone is the blog of a teacher, reader, reviewer, and technophile. I am middle school language arts teacher who loves, loves, loves to read (and always has!). When I started blogging I wanted to open a window into my classroom while also helping other teachers and parents find books for their tweens/teens. Very quickly I realized that my real mission was to spread the joy of reading and reading aloud with kids who aren’t traditionally seen as readers or potential read-aloud audiences. I’m not always sure which category my blog falls into. Is this an education blog? A book blog? A kidlitosphere blog? A YA blog? A teacher blog? Regardless of the category, I love reviewing books. With or without the blog, I would be reviewing. Being a teacher/blogger puts me in an interesting position as a reviewer. I don’t get boxes of books everyday, but I do get a decent amount of review copies (and a few ARCs here and there). I’ve made it clear from the beginning that I do not guarantee a review for every book I read. I would need 6542 hours in a day to read all the books on my TBR pile, do my school work, go to work, and have a normal life. But I do promise to read every book I receive. And I promise to booktalk all books to my classes, as they all end up in my classroom library. ARCs and review copies move to my classroom library as soon as I finish reading them, where they are shared with my students. I have between 50-100 students per year and every class reacts to review copies and ARCs the same way- with awe and excitement. Teachers are an untapped resource for publishers and authors. This isn’t saying that all teachers want to read and share books with their students and not all teachers will have the time to devote to it. But even a few books a year for a teacher will then be shared with their classes. The anecdotal evidence in my classroom shows over and over that word-of-mouth is the best way to share books with kids and build buzz. My kids devour books and recommend them to classmates, friends, cousins, online friends, and parents. Just before spring break a group of my students was passing around Evermore (The Immortals), a book I read and did not get a chance to review. I haven’t seen the book in weeks- my students read it, passed it on to a classmate in a different class, and it’s somewhere down the line now. I’ll get it back before summer break, but I am thrilled that they are reading and sharing the book! I also have a another group of girls who bought the book because they didn’t want to wait for their turn to read it. And they all have the release date of the sequel written in their planners! One review copy sparked all of this frenzy from kids who otherwise might never have discovered the series or Alyson Noel as an author. While I sometimes feel guilty that I don’t get to review every.single.book I receive, I feel better when I watch my students read and recommend the books to each other. And even better when I see them buying books! Publishers need to reach out to schools and teachers, especially teacher bloggers. We spend most of our lives in front of an untapped audience. But How Do I Get ARCs? Getting Free Books Sounds Cool! I get a few emails a week asking me how to get on ARC lists. To be perfectly honest, I get very few ARCs. The ARCs I do get usually come directly from authors or from giveaways. I rarely ask authors for ARCs. If an author asks for reviewers to contact them and it’s a book I want to read, I shoot off a quick email. Megan McCafferty recently did this for the release of Perfect Fifths: A Novel. Because this is my favoritest series, I shot her an email and hoped I would get an ARC. I was extremely lucky and did! Do I get a ARC everytime? Heck no! But it’s worth the few minutes to type up an email or enter a comment contest. If you are interested in ARCs, start up a blog! But remember, while this is a hobby that I love, it is work. Check out the blog angst posts the pop up every few months and you’ll see people who are retreating a bit. There are days (and weeks) when I feel completely overwhelmed. But I love the community in the blogosphere and I love my blogging colleagues and friends- people I have “met” online like Stacey at Two Writing Teachers, the amazing Kathi Appelt, Karen at Literate Lives, Jen at Jen Robinson’s Book Page, Terri at the Reading Tub, and so many more! As a professional community, the blogosphere can’t be beat. I also love having the ability to read books, build buzz, and shout my favorites from the mountaintops. It’s so much fun! If you do start a blog, begin with reviews of your own books- whether they come from the library or the bookstore. Build up a blog, make sure this is something that you want to do, and create a blog that authors and publishers can take a look at when you contact them. If they see you are reviewing they will be more likely to take your requests seriously. How many reviews? How long should you blog? I don’t think there is one answer to this question. I blogged for about 6-8 months before I started contacting publishers and publicists. At about the 1-year mark I was starting to receive review copies. If you do start a blog, be proactive! This isn’t high school- no one is too cool or too uncool. Leave comments on blogs and posts you read (though I am notoriously awful at doing this myself). Insert yourself into conversations. Join blogging groups like the Yahoo Kidlitosphere group. Put yourself out there! And go to any events that you can- author readings at your local bookstore, online chats (like those at Readergirlz), industry events (like BEA and ALA), and anything else book-related. The Kidlit Blogging Conference is awesome (or so I’ve heard…I’ll make it there someday!). Just make yourself known and connect. You’ll build a readership. You’ll learn from other bloggers, And you will network. Another hot topic this week was author requests. I don’t receive a ton of author emails asking if I will read/review their books. But I do enjoy receiving emails from authors who have taken the time to read my blog and my About Me page. Do I care if they call me “TheReadingZone” instead of Sarah? Nah, because I make it a point to leave my real name out of the blog as much as possible (it’s a teacher thing). But I do care if they take the time to notice what I read and review. I don’t read and review adult books, so it’s silly to request I do so for you. However, if your book is education-related, then I might read it. Just send a personalized email, not a form letter. I try to respond to all emails.